How to prevent my screen from either dimming or the screen-lock starting when watching YouTube? My screen brightness used to dim after a few seconds to preserve battery. This is default in Ubuntu 12.04. However when watching video it should not dim. This works correctly when I watch videos using native applications like VLC. With in-browser video, however, the screen is not prevented from dimming. This is very annoying as you have to move your cursor every 10 seconds or so. I used to use Mac OSX where I had the same dimming settings and Flash videos were taken into account correctly. Anyone an idea how you can make YouTube prevent your screen from dimming? Save this file as ~/bin/flash_saver.sh. Run the program "Startup Applications"
Under comment (if you want) type a brief description. E.g. "Stops screen turning off when Flash is running"
This probably will not work if you are using an Ubuntu version newer than 12.04 (have tried in 13.04 and 13.10 and it just does not work at all). It seems the main developer is not working anymore in this project, so the chances of it being fixed are not good. vlc for VLC, mplayer for Movie Player, etc. There is a nice little script on GitHub called lightsOn which should do the trick you want. Basically it looks for full screen video (flash in firefox or chromium, mplayer or vlc) and if so disable xscreensaver and also the auto power-manager dim screen capability. Thus call the script from your autostart folder as per my answer here. remember to give the script execute rights to run i.e. 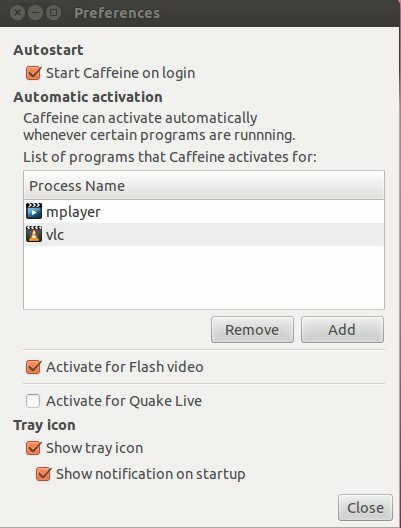 Webupd8 had an article about Caffeine and Lightson.sh to disable the screen saver while Flash or HTML5 videos are playing. The Lightson script works for both Firefox and Chrome and can be set to include VLC. I hope this will help. You should not only check the screensaver options, but also the power management options, especially the "Put display to sleep when inactive for ..." option. Note that on laptops, there are two settings with that name: when the laptop is running on AC power and when it is running on battery. Use Caffeine : ppa page. Hit Alt + F2, then type caffeine. Click the "Caffeine" icon, then click "Disable Screensaver". But I don't know how to handle the fact that some executables don't have the name than their processes (for instance /usr/bin/google-chrome runs as chrome). For those who are using a screensaver other than gnome-screensaver (which is the default screensaver in Ubuntu starting with the 11.10 version) this answer may be helpful. Personally, I didn't change out gnome-screensaver for something else and, I don't know for what reasons, Caffeine doesn't work for me in any way (maybe is outdated). That being said, starting from others' bash scripts (this, this and this), I managed to make a new script, gnome_screensaver_off.sh that works perfectly for what I intended when YouTube is using Flash player for rendering videos. mkdir -p bin - this command will make a bin directory in your home folder if you don't already have it. gedit ~/bin/gnome_screensaver_off.sh -this will create the new file gnome_screensaver_off.sh in gedit. Go back into terminal and run: chmod +x gnome_screensaver_off.sh - to grant execute access for the script. To run your new script, run ~/bin/gnome_screensaver_off.sh. Search in Dash for Startup Applications, open it and click Add. Under name type "YouTube Monitor" or something you will recognise. Under command type "/home/$USER/bin/gnome_screensaver_off.sh" (change $USER with your username). Under comment (if you want), type a brief description (e.g. "Stops screen turning off when Flash player is running in browser"). Thanks for the suggestions offered by: fossfreedom, Meer Borg, njallam, desgua and others. The simplest nonintellectual approach which is desktop-agnostic and relies on xdotool would be to simulate a key stroke every N seconds. I launch the script while I play the video, and then stop it when it is not needed anymore. xdotool can be installed with sudo apt-get install xdotool. A potential downside of this solution is that your screen will not sleep even if you are just listening to music or radio, but I assume that in most cases this is not an issue. Use "0" (zero) to keep it on or another value to define the delay in seconds. The following script will keep the screen on until some key is pressed. Run it from a terminal. The VLC in this PPA in addition to being a current version of VLC also correctly implements screen saver inhibition. Also can you try unchecking the hardware acceleration option on firefox? For those using Ubuntu-Gnome 14.04 there is a simple yet useful Extension called Caffeine which provides a toggle icon which allows you to disable the light dimming and screen saver behaviour from the top bar with a click. CAUTION: the Exec's value in the code should be path of the-bund-light.sh in your computer. It depends somewhat on what version of Ubuntu you are using. In 11.10, you can find "System Settings" in by clicking the gear icon in the top right corner of the screen. Select this, and in the dialog that pops up, select "Screen". You can set the amount of time that your computer will be idle before the screen blanks with the dropdown menu, or disable that feature by clicking the button labeled "Lock". If you have an older system, you may have to look elsewhere for this setting, but it is there somewhere. It simulates a left shift key press once every minute, which prevents the screen from going dim. The drawback of this, of course, is that you have to run the script every time you watch youtube. On the other hand, it is simple and works with most, if not all, configurations. gsettings set org.gnome.desktop.session idle-delay "$1"
gsettings set org.gnome.settings-daemon.plugins.power sleep-inactive-ac-timeout "$2"
gsettings set org.gnome.settings-daemon.plugins.power sleep-inactive-battery-timeout "$3"
gsettings set org.gnome.settings-daemon.plugins.power idle-dim "$4"
BTW, this script disables screensaver ONLY when the video is playing, i.e. when flashplayer is in the top of CPU consumers. How do I stop the screensaver from turning on when watching videos online? How to start applications such as xcompmgr at start up? How to disable screen lock timeout from a script? How to disable screen dimming after inactivity when this is already disabled at system settings? How do I stop the lock screen from dimming to black?